Home / Français / Eto’o veut entraîner le Cameroun ! 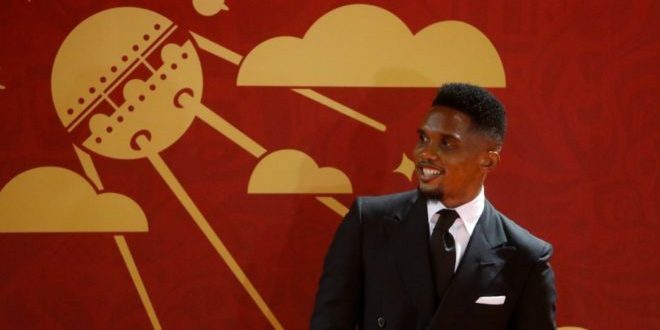 Eto’o veut entraîner le Cameroun ! “Entraîner l’équipe nationale de mon pays est un devoir. Si je me lance dans ce métier, ce sera mon devoir d’apporter mon expérience et ma connaissance à mon beau et cher pays le Cameroun.” C’est ce qu’affirme Samuel Eto’o dans une interview accordée au site Newsducamer etpubliée ce jeudi. Etoo..was a good footballer, one of the best footballer in Africa and the world.. But please, you are who you are but dont come and spoil football in cameroon with your dirty small political brain.. This dude came to support the old lazy Despot BIYA to be reelected…. A man who failed for over 35 years…A man who practices divide and rule..
Etoo being a coach might start this dirty game in cameroon football..
what was his achievement as captain of the Cameroon national team? He made a name out of Cameroon, but not in Cameroon. His humanitarian gestures should not be misinterpreted for management qualities. Even out of the country, what are his achievements as a captain? What has Messi achieved with Argentina as captain? What did John Terry achieve with England as captain? What did Drigba achieve with the star studded CIV? What did Gyan achieve with Ghana? From the looks of it, Mane and Salah may never achieve anything with Senegal and Egypt respectively. Why Eto’o ? Look at How this 40 year young boy is planning to ruin Cameroonian football! Water for beans! Too be honest, I’ve seen Eto’o expressed more interest (and action) to seeing Cameroon football grow than most if not all former lions. We now have two of Africa’s best keepers, yet we forgot how that was possible. Coaching job is too small for Eto’o even. President of fecafoot is his call.